A collaborative project of the Goethe-Forum with the Arsenal - Friends of the German Cinema, Galerie Peter Herrmann, the Kalkscheune and the Goethe Institutes Berlin and Johannesburg. Frau Christina Rau, spouse of the German EX-President Johannes Rau, and Prof. Dr. Jutta Limbach, President of the Goethe Institute opened the exhibition. A gallery opening, a farewell gala, and an 82nd birthday party, all in one night. 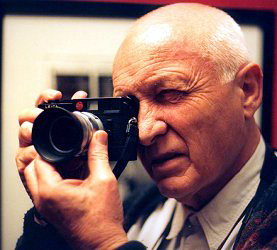 Although Berlin-born Jürgen Schadeberg and his wife Claudia are already leaving the city they had hoped to settle in, after having returned for only two years. They are moving on, to the south of Spain, where people will be willing to be photographed once more. We would like to hold a joyous vernissage a few days before he leaves and celebrate the move and his birthday with him. In the exhibition we were showing some 60 photographs extracted from the series Voices from the Land and Tales from Jozi. An accompanying film program was prepared. 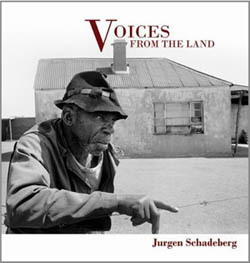 Voices from the Land depicts black and white images of agrarian South Africa, where people continue to live in near feudalism until today, and poverty is close at hand. This subtle and calm series displays the documentarian claim of the photographer. In contrast is the series Tales from Jozi. Here, the blazing city life jumps to color and shows us Johannesburg in all its facets. The books on these series and others, such as The Black and White Fifties, which we exhibited in 2003, will be sold in the gallery. Bye Bye Berlin, A farewell show and 82nd Birthday Party!